The moment you walk into the Dinosaur Bar-B-Que, you know you’re in for something different. The sound of overlapping voices and the smell of fresh barbecue fills the air as people dig in to family-style platters of chicken, pulled pork, or brisket with gooey mac and cheese and homemade cornbread on the side. These smoky flavors satisfy couples on a low-key date — because who isn’t tempted by slow-cooked pork or chicken smothered in sizzling sweet sauces? It may be a little messy, but it’s worth every drop. Dinosaur Bar-B-Que began in 1983 as a mobile concession stand serving barbeque at motorcycle shows, fairs, and festivals in the Northeast. John Stage and his partners attracted long lines of people hankering after traditional slow-smoked barbecue done right. In 1988, Dinosaur Bar-B-Que set down roots in Syracuse, New York, opening a quick-service joint. Now the Dino, as locals call it, has eight additional locations scattered throughout New York, Connecticut, and New Jersey. When expanding to a new location, the Founders seek out buildings with a lot of history and character, so visitors can feel part of a time-honored, communitywide tradition of eating well and loving life. You can see layers of messages carved into or scrawled on the wooden tables and the walls at Dinosaur Bar-B-Que. Countless couples have marked down their names in hearts, so they would always remember the table where they had their first date or celebrated a special moment. If you’re looking for a low-key spot to take a date, you can’t go wrong settling in at Dinosaur Bar-B-Que and treating yourself to its flavorful signature dishes. Dinosaur Bar-B-Que provides a chill place where daters can relax while they eat delicious plates of barbecued meats and veggies. The menu has plenty of vegetarian, vegan, and gluten-free options to satisfy people with different dietary needs. These high-quality dishes offer couples a mouthwatering dining experience. The Sweetheart Meal, which includes two full racks of ribs and four sides, is perfect for two people to share on a date. The Dino will sometimes partner with breweries, trivia organizers, or other entertainment groups to give diners a little something special during their visit. Dinosaur Bar-B-Que infuses its slow-cooked meats with spices and smoky flavor. Many couples are blown away by the Dino’s rich and flavorful dishes, including all-natural pork ribs and slow-smoked brisket topped with pickled onions and jalapeno relish. Dinosaur Bar-B-Que also has more than 12 homemade side dishes, so whether you’re in the mood for a Cajun corn, fruit salad, or beans, you can load your plate with your flavors of choice. Dinosaur Bar-B-Que isn’t your average barbecue place. The team seeks to give diners a memorable experience every time they stop by. People don’t have to just eat and leave — they feel welcome to stop and savor. Many couples linger for hours enjoying good food and good company in a lively setting. 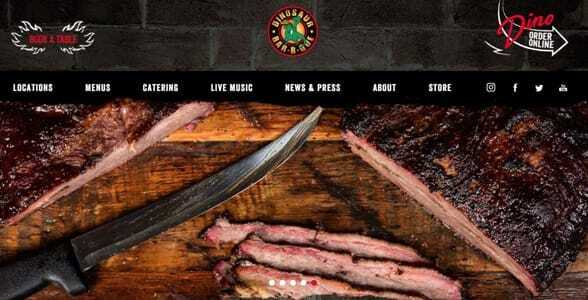 Six of Dinosaur Bar-B-Que’s locations host live music at least once a week to give their guests a reason to stick around and sway to the music. The restaurants invite local bands to play country, blues, or rock music while people settle in for a savory dinner. The Dinosaur Bar-B-Que in Syracuse features musical performances six nights a week — and the locals can’t get enough of it. People from all walks of life love hanging out at the bar and applauding talented bands and singers. You can check the calendar to see who is playing on your next date night. Dinosaur Bar-B-Que sets the stage for romance on the nights it showcases live musical performances. Couples can enjoy a relaxed party vibe, split a pitcher of beer or a plate of chicken wings, and stay for hours in a relaxed setting. The Dinosaur Bar-B-Que team gets rave reviews from a lot of customers. 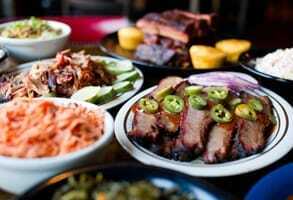 It has been around for decades and has become a fixture for many couples who have spent dozens of dates happily digging into platters of barbecue. Some couples love the food so much that they had Dino cater their weddings or rehearsal dinners. Whether you’re going on a first date or about to propose to a longtime partner, Dinosaur Bar-B-Que can help you get over your nerves and enjoy the moment in a casual setting. Good Morning America named Dinosaur Bar-B-Que the number one barbecue joint in the nation. Hot. Juicy. Flavorful. What’s not to love about barbecue? These dishes take hours, sometimes days, to get the flavors just right. The Dinosaur Bar-B-Que team takes their time to prepare your food, so you can take your time to enjoy it. You can linger for hours in a casual atmosphere full of locals having fun. Couples at the Dino don’t just get a savory and filling meal — they get a full night out complete with signature drinks, live music, and friendly service. It’s a rowdy and accessible place to enjoy homemade food dripping with award-winning sauces. 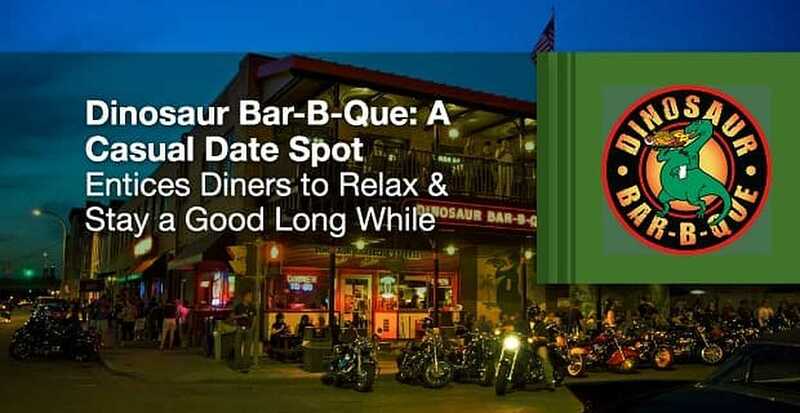 Whether you’re starting a new relationship or trying to get out of a dating rut, you can improve the quality of your nights out with that special someone by making a pit stop to one of Dinosaur Bar-B-Que’s locations in the Northeast.